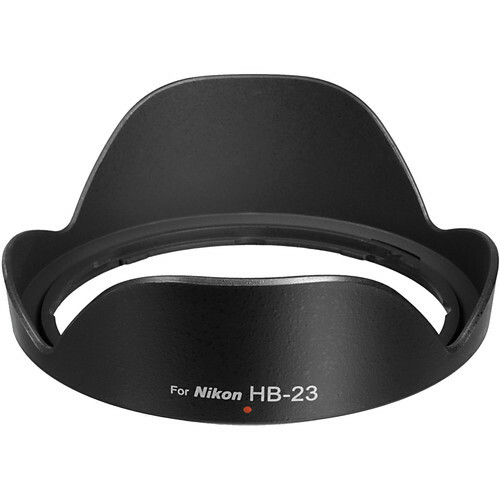 The dedicated Vello HB-23 Lens Hood is specifically designed for use with Nikon's 10-24mm f/3.5-4.5G, 12-24mm f/4G, 16-35mm f/4G ED VR, 17-35mm f/2.8 ED-IF, and 18-35mm f/3.5-4.5 D-AF lenses. It is primarily used to prevent unwanted stray light from entering the lens by extending and shading the end of it. A dedicated hood is crafted to perfectly suit the specific focal length of the lens it is designed for. Additionally, this hood features a non-glare matte finish on the interior surface to further prevent or limit lens flare. Also, since the end of the lens is extended, you get the added benefit of some extra protection from accidental impact. The "petal" shape of this lens hood maximizes the amount of hood coverage for the minimum amount of weight and hood area. The bayonet mount is designed to also work in the reversed position, allowing the hood to be placed backwards over the lens for a more compact storage solution. Box Dimensions (LxWxH) 5.0 x 4.5 x 2.0"
HB-23 Dedicated Lens Hood is rated 3.5 out of 5 by 10. Rated 4 out of 5 by Jerrry from VELLO HB-23 w/a lens hood Original equipment Nikon HB-23 broke off the 16-35/f4 when it swung into a door frame. Due to its plastic construction, the shade took the shock and not the lens...less expensive to replace a lens hood than have a lens repaired. I ordered both the Nikon HB-23 and Vello's version to see whether there was a difference between them. The Vello was about a third less than the Nikon. The Vello's material was slightly thinner than Nikon's and more pliable, seemingly better suited to absorb shock. I returned the Nikon shade. Rated 2 out of 5 by pjime from Did not adequately meet specs I bought this hood to use with my Nikon 12-24mm f/4 G, 17-35mm f/2.8D AF-S wide angle lens. This hood did not adequately fit the lens. It is technically usable, but it feels like it has to be screwed by force after several tries, to the point where I became concerned that I might be doing damage to the lens. I don't know whether this is a pervasive problem or just a glitch on my individual product, but I ended up ordering the corresponding Nikon hood, which has worked perfectly. Rated 1 out of 5 by bb3ii from Spend the extra on the Nikon! P O S! Fits poorly...secure, but poor fit. Not convenient at all as you are afraid your going to break it taking it off. Rated 4 out of 5 by Anonymous from Works Can't imagine why the Nikon hood would be any better than the Pearstone. Depending on the angle of the sun, you are going to get flare with the 17-35 lens. Period. The hood would have to be three time the size and then the wide angle would be worthless because the hood would get in the way. At least it prevents me from hitting the front of the element on anything. Rated 1 out of 5 by Jeffrey from Waste of Money As others have noted, requires more force than it should to get it to snap security onto a Nikon 12-24 lens. Indeed, the hood cracked the last time I tried to get it off and is now unusable. Save yourself the cost of this hood by spending more for the authentic version. Rated 5 out of 5 by Photoneal from HB-23 lens hood I use this hood on my 12 to 24mm Nikkor as well as on my 17 to 35mm Nikkor. It replaces the original and is far sturdier. It is still the Nikkor bayonet system for these lenses so you have to make sure it stays put. Rated 5 out of 5 by Walkabout from Fits Fine Clicks on, fits, and looks original. i NEED A REPLACEMENT LENS SHADE FOR MY NIKON 16-35 MM LENS. IT IS A VELLO HB 23. THE AD SAYS IT IS DEDICATED. HOW IS THAT DIFFERENT FROM THE NIKON BAYONETE LENS SHADE? I had no trouble with this shade on my nikon 17-35 lens and never kept in a bad but in daily use as a newspaper photographer. I know of no difference from the original it replaced except that it is aftermarket.